L. Linum usitatissimmum, Fr. lin à fibre longue, Eng. flax. Annually this herb produces one stalk and blue flowers from April to July. The plants were among the most treasured in Hispano-Arab gardens in Al-Andalus of the 11th C.
The fruit, containing two seeds is round. The seeds are used to make flour and linseed oil (linaza) is extracted from them, especially in the Orbigo Valley (León). During the Middle Ages, it was used in food preparation and still today it is preferred in certain dishes. Further, the oil is used in making varnish and paints. Seeds, scalded in boiling water and mixed with honey, are drunk as an infusion. Medicinally it was used for inflammations in the digestion system and respiratory tract. 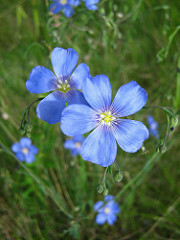 Flax was known in Babylonia at least 7,000 years ago. It appeared in Europe between the 5-6 C. B.C. It was cultivated in Andalusia and exported to Alexandria and Cairo via Venice. Muslims held flax material in high regard for its richness, quality and delicateness. The hemp, flax and silk industries gave many families livelihood not only in Muslim Spain but also in Estremadura. After the fall of Granada in 1492, Christians continued the business. Not only did they export it to America but fostered the development of this industry there. The English used flax in a medicinal bath that was supposed to be a cure all. Symbolically flax was a good thing for have for it meant: money, healing, protection, psychic powers and beauty. See tascos. 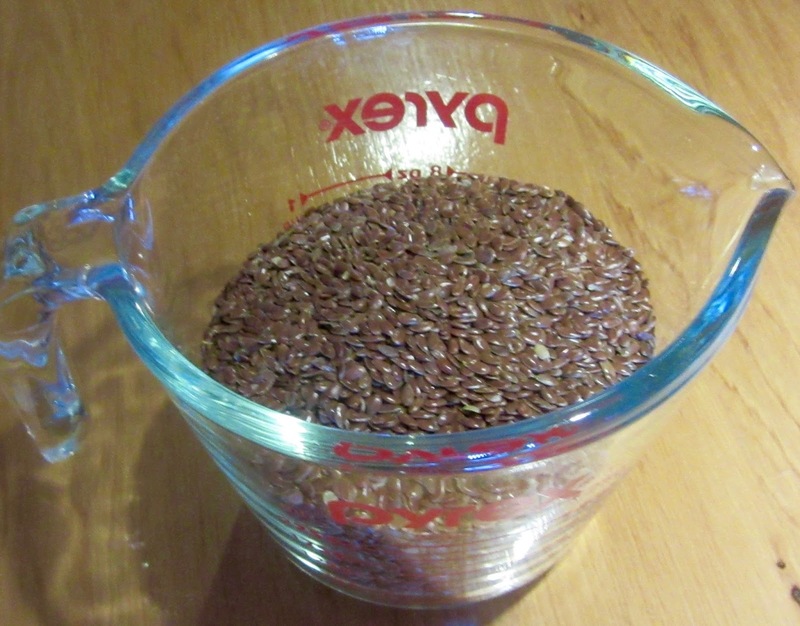 None of the Spanish medieval texts available have recipes calling for flax. In a large bowl, mix dry ingredients. Stir in the warm water, honey and olive oil until it forms soft dough. Turn out dough onto a floured surface, add more flour if dough is too sticky and knead dough for 5 minutes until smooth and elastic. Cover and let rise for 20 minutes in a warm place. On a floured surface cut dough in half. Roll dough to form a French bread like loaf. Place on a baking sheet lined with nonstick liner. Lightly flour the bottom of loaf and place on liner. Cover again with clean towel and let rise for about 30 minutes. I found this took much longer for me. Bake loaves for 30 minutes or until sounds hollow when tapped on bottom.